I think this is a first one for me. Up until now, I have never reviewed an album from a band coming from Georgia. I don’t mean the state in the South of the USA, but the former Soviet place wedged between the Black Sea and the Caspian Sea. Ennui are a funeral doom death metal band from the capital city Tbilisi located in the middle of the country. Formed in 2012, the duo has been active, releasing two split records and making End Of The Circle already their fourth longplayer. In the past, they always had long songs and their albums always used the CD storage capacity to the max, but this time they went even further. 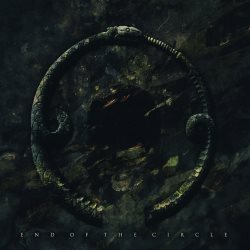 Although End Of The Circle is at nearly seventy-three minutes their "shortest" album to date, it only contains three tracks, two of which seem to make up a concept. So if you do a little math in your head, you’ll know that the songs are really long. I have already encountered doom, drone of black metal bands whose long songs were mostly monotonous repetition and frankly barely listenable, but that is not the case for Ennui. Let’s start with the opener and title track End Of The Circle, at thirty two and a half minutes the longest track on the album. You get the slowest of slo mo metal, with the rhythm probably rarely making it over 60 BPM. As both musicians are in charge of guitars and keyboards, it’s possible that the drums are programmed, and who can blame them, because it must be really hard for a drummer to keep that infernally slow pace and not falling asleep. One guitar is really tuned low, adding for a crawling death metal atmosphere, while the other guitar is overlaying more atmospheric textures, and it’s that contrasting game which makes the album throughout enjoyable. The vocals sound like coming from the deepest depths of Hell, and further emphasise the desperate nature of the music. Ten minutes into the opener, there comes even a surprising uptempo part where the two Georgians show that their project is about more than just funeral doom. The second and third track are both exactly twenty minutes long, and are titled The Withering Part I: Of Hollow Us and The Withering Part II: Of Long Dead Stars, and continue in that same direction. In the end I was surprised by the professional recording of the album, because I suspected that as a relatively unknown place for metal, Georgian bands might have a more modest sound. Not so Ennui, whose take on funeral doom death metal is refreshing by the fact that they use a lot of different parts and textures to make their mammoth tracks pleasant from beginning to end. Many bands in the genre either sound utterly boring or don’t dare to stretch their songs to the max, but Ennui – fitting band name, by the way – have found the right balance between murderously slow rhythm and sufficient variety to make them one of the most inspiring bands of the movement. It’s definitely not an easy album to listen to, but if you want your doom death metal really extreme, Ennui from Georgia are the place to start.